The Bay Area music community is coming together to remember and celebrate the late Ronnie Montrose, who passed away March 3 after a long battle with prostate cancer. 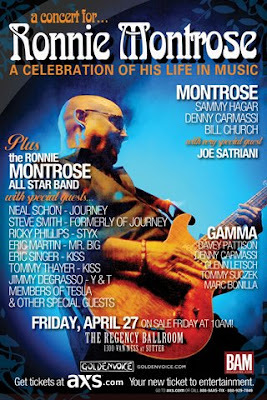 “A Concert For Ronnie Montrose – A Celebration of His Life In Music” will see Sammy Hagar reunite the original Montrose band, plus Joe Satriani, to perform the group’s landmark 1973 debut album...plus a variety of special guests. "A Concert For Ronnie Montrose - A Celebration of His Life In Music" will feature the original Montrose lineup (Sammy Hagar, vocals; Bill Church, bass; and Denny Carmassi, drums), performing the landmark first Montrose album, with special guest Joe Satriani on lead guitar. The original Gamma lineup (Davey Pattison, vocals; Glenn Letsch, bass; Denny Carmassi, drums) will also be on hand, with special guest Marc Bonilla on lead guitar. There will also be an All-Star band, comprised of many of the great musicians that Ronnie played with over the years. Some of the confirmed artists include: Neal Schon from Journey, Steve Smith formerly from Journey, members of Tesla, Eric Martin from Mr. Big, Rickie Philips from Styx, Eric Singer and Tommy Thayer of KISS and Jimmy DeGrasso from Y & T and Alice Cooper. The Montrose tribute will be held at the Regency Ballroom in San Francisco on Friday, April 27. Tickets go on sale on March 30 at 10:00 am. Full show details are available here.